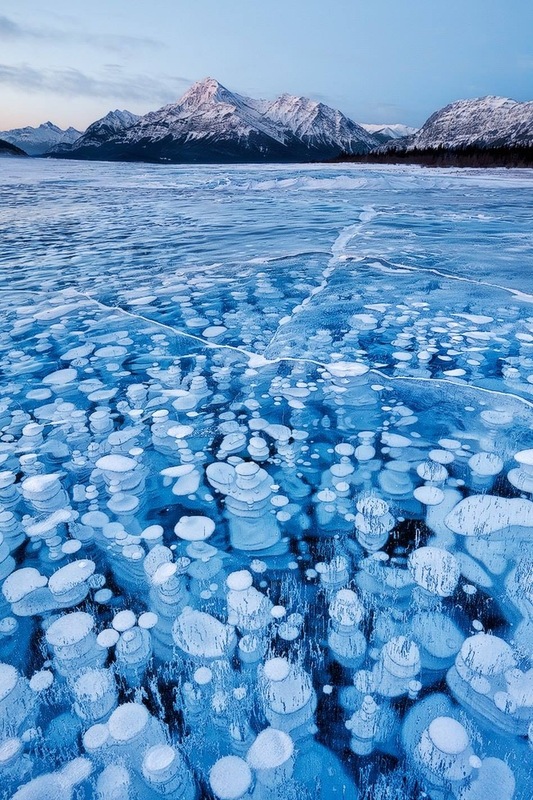 Methane bubbles trapped by ice in Northern Canada. According to Guy McPherson, NASA’s CARVE project has seen a great release of deep-water methane due to heating of Arctic waters, with stretches of sea up to 150 kilometers releasing such gasses. Several weeks ago I reported on the death of Michael C. Ruppert. His passing was self -inflicted and was anticipated by many who’d followed his work. In the last months of his life, the VICE Network people made a documentary about his work called Apocalypse, Man. After I viewed it, I started looking at the blogs and videos that Ruppert had been recommending. This included the work of people like Guy McPherson, a professor emeritus in Natural Resources and Ecology and Evolutionary Biology from University of Arizona. McPherson gave up his university job several years ago after being restricted from teaching classes (he talks about this in the linked video). Guy McPherson is the author of Going Dark. Hence today’s title. The spirit of McPherson’s YouTube lecture is summed up in one of the graphics used in his presentation, dedicated to those who think he’s too dark. from the Demotivators collection. go buy something from them. I won’t go into all of McPherson’s predictions from the video presentation, but here’s what you need to know. He starts by stating that the global heating we’ve already seen (from the ‘baseline’ of average temperature of the planet prior to the Industrial Revolution) has been almost a full degree centigrade. This temperature change is NOT evenly distributed–the Northern Hemisphere and especially the Arctic has seen temperature jumps considerably higher. Using statistics from the last few decades, he notes that the world hasn’t had a month of below -average temperatures since February 1985. Regarding the higher average temperatures in the colder climes, McPherson is especially concerned about the numerous self-reinforcing feedback loops we’ve arguably already set in motion. He counts some 30 feedback loops that have started. These are situations such as the melting of Siberian permafrost, which has the potential to release several gigatons of methane into the atmosphere. Methane is also shooting out of the floor of the Arctic ocean as formerly frozen waste thaws and methane starts to escape. Another feedback loop is the drought caused by increased heat and overstressed water supplies (metropolitan areas like Tuscon, where McPherson used to live, continue to grow despite their lack of nearby access to water). This drought makes forests more vulnerable to forest-fire conditions–and the smoke and carbon released by forest fires exacerbates the amount of carbon in the atmosphere. (Just to clarify–these are not McPherson’s personal predictions. He has amassed a number of sources to back up his claims, and skeptics can easily fact-check his assertions by taking notes during his video presentation. During the first 20 minutes of the presentation, he lists the many organizations whose work he’s drawing his conclusions from. These include the UN Environment Programme, the Hadley Centre for Climate Prediction and Research, The Intergovernmental Panel on Climate Change, Nature Climate Change, and the Arctic Methane Emergency Group). As McPherson explains, such feedback loops could escalate quickly–an average temperature change of 1 to 2 degrees centigrade could easily escalate to double or triple that if some of the other issues already identified are as devastating as worst case could make them. The more conservative predictions from the last ten years list temperature changes of 3.5 degrees centigrade, perhaps by 2035. Humans were not present on this planet the last time temperatures were at 3.5 degrees above baseline. And this is not about whether humans could survive in temperatures in the 100-120 degree range–surely some of us could. The question is would we have anything to eat? Would we have water? Would we be able to establish stable communities when storms and seasonal swings of temperature become much more pronounced? The solution currently touted by some climatologists (and it is a technological Hail-Mary pass) is Geoengineering. Their suggestions include the distribution of billions upon billions of reflective particles in the upper atmosphere with the hope that the lessened sunlight would counteract the greenhouse effect of methane and C02 gasses. McPherson and others feel that this would cause more harm than good. And even the scientists who advocate for such a strategy have been forced to admit that if the seeding of the atmosphere were to stop, the mean temperature would quickly return to whatever it was prior to the particles being distributed. Fortunately, Dr. McPherson sees one ray of hope in all this. We just won’t like it. In his view (and the view of most who are watching these developments), the only chance we have to avoid the worst of this calamity is if we experience economic collapse. By this, he means real economic collapse orders of magnitude greater than what we saw with 2008. McPherson notes that in 2008 during the worst economic crash since the Great Depression, we still saw carbon emissions going up worldwide. The economic collapse that we would need in order to really arrest carbon and methane levels would have to be on the order of a collapse of civilization. If money meant nothing, if fuel stopped flowing, if commerce stopped, if the lights wouldn’t turn on–that’s the only sort of collapse that would keep global warming at bay and give the planet a breather for a few years. However, even this would not guarantee the survival of life. There are some 435 nuclear power plants currently operating that would need to be shut down in an orderly fashion in order to avoid (McPherson’s words) four hundred plus Fukushimas. Shutting the plants down and decommissioning them would take upwards of 40-60 years per plant. In the envisioned economic collapse, it’s hard to imagine anyone in leadership having the foresight to attend to this properly. BTW, one of the statements made by Michael Ruppert in the Apocalypse, Man series regarding off-the-grid living is pertinent. If we are going into a world of permanent climate disruption, there is scant possibility that off-the-grid permaculture societies can survive any better than the world’s humans at large. This is especially true in light of the world’s inability to manage the unfolding crisis of Fukushima. Abandonment of the Fukushima site due to uncontrolled radiation release is arguably an extinction level event. Guy McPherson does not consider himself a doomsayer. He is not the sort of ranter you would catch on Alex Jones. If he is to be believed, he isn’t making big bucks out of his lectures and book sales. He’s calm. He looks reasonably okay in khakis. He seems willing to suffer fools gladly. And he projects his vision as actually being positive–that while his message is depressing, we as a species need to embrace the truth. As he puts it, most of us humans have known since the age of ten or twelve that everything must die, including us. There is no benefit for the politician who is finally tasked with this news to come forward. Like the issue of peak oil/peak resources, nobody in power wants to deliver the bad news. If McPherson is wrong (and if Michael Ruppert was wrong), they at least gave us their best analysis. And if they’re right, their warnings should at least be considered a wake-up call. Because for what it’s worth, my suspicion has always been that the people in charge simply aren’t going to tell us. Dan, these “reflective particles” you mention… is this, most likely, what all the chem-trails are all about? Didn’t I read that a team in Germany analyzed one and found aluminum and mercury among other things? Here, in Sweden they are so common that going a day without seeing one is very very rare. Excellent article. I was left with an odd sense of relief. The relief of finally “knowing” truth? (Or, at least, having been provided with a sensible and rational scenario. The reflective particles are different from chemtrails. Chemtrails were fairly reliably reported on by Dr Rosalie Bertell, a PHD and Grey Wolf order nun (friends with the Plowshares and anti-nuke movement). Interestingly, per Dr. McPherson, there was a very slight but discernible uptick in surface temperatures after 9/11 grounded most airline flights for a week. So particulate matter in the upper atmosphere does affect surface temperature. According to Bertell’s 2000 book PLANET EARTH–THE LATEST WEAPON OF WAR, there were numerous experiments with changing climate during the Cold War. I found it all terribly depressing to read, frankly–the Pentagon was dropping millions of copper pins in the atmosphere to see what effect it would have on the magnetic poles.